As if the football fanatic in your household needs an accelerant. We know, we know. Nonetheless, accelerant recipes are part of our mission over here, so for those seeking a new World Cup viewing libation, please see below for patriotic suggestions from a carefully curated selection of experts. No, not soccer experts. Booze experts. We’re down to the quarterfinals so there’s a good chance that you’re first choice team is out of the running. Bummer. The good news is all of the teams still in contention have strong drinking cultures. So, if your team is out of the running, obviously you need to defect to another team whose national, um, spirit? appeals to you. Also, feel free to choose sides based on how much work you want to put into your cocktail. If you’re looking for something fancy, we suggest rooting for Brazil. If you’re feeling lazy, how about a shot of herbal vodka with a beer chaser while you cheer on Sweden? Directions: Add all ingredients to a blender with half a cup of ice and blend until smooth. Garnish with berries and freshly grated cinnamon. There’s a good chance that if you’re choosing to show your support for Belgium as they take on Brazil in the quarterfinals, you’re going to do so with a beer. Because options. So many options. But let’s say you’re in the mood for a cocktail? Try a Black Russian, which apparently was created in Brussels in the late ‘40s. It’s easy as hell, and exactly like the White Russian except without the cream, so we’re pretty sure that makes it “whole 30” compliant. Directions: Add ingredients to a mixing glass with ice and stir. Pour over a big chunk of ice in an Old Fashioned glass. Award winning music icon, Jon Bon Jovi, Jesse Bongiovi and acclaimed French winemaker, Gérard Bertrand launched rosé wine label, Hampton Water which has already been recognized as one of the top 5 rosés in the world. The idea to create a wine, emblematic of a bon vivant lifestyle, emerged during time spent in the Hamptons, between Bon Jovi and his son. The wine is described as a fresh and lively rosé, with distinctive minerality, featuring Grenache, Cinsault and Mourvèdre, grape varieties characteristic of the French Mediterranean region. 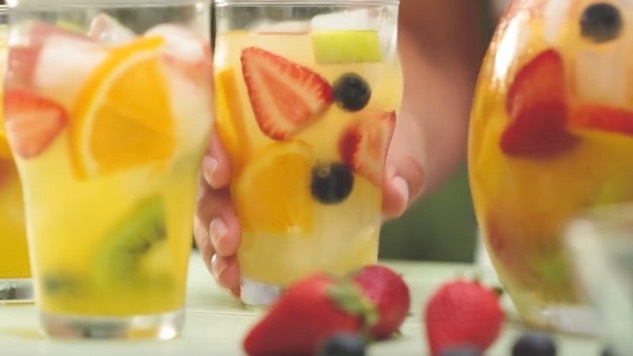 Clerico is basically a sangria made with white wine, so it’s the perfect cocktail to whip up in large batches for a group while you’re watching the France v. Uruguay match this weekend. Directions: Cut up all the fruit. Pour wine into a large pitcher and add sugar. Stir until the sugar dissolves. Add the cut fruit. Top with lemon-lime soda. Stir again and chill in the fridge for an hour. If this canned-format Bramble doesn’t appear in your local shops, look up the recipe; it’s not hard to do. Other reasonable British tribute bevvies include ale, cider, London dry gin, and of course, Pimms with cucumber slices. The Bramble is a cocktail created in 1980’s London. The original brings together dry London gin, berries, and citrus. The Half-Seas Bramble pays tribute to that original recipe with the added touch of effervescence. At 12% alc/vol in 200ml cans, these cocktails are close in proportion and strength to a cocktail you would receive at a bar. The suggested retail price is $16-$20 per 4-pack. Like most Scandinavian countries, Sweden is basically a vodka country, only they call it Brannvin, which is totally different because it’s made from potatoes or grain…just like vodka. If you season that Brannvin you call it Akvavit and claim that it has medicinal properties. We like Sweden for this reason and also Ikea. If you’re going to drink Akvavit like a true Swede, you’ll sing a song first, take a shot, then chase it with a beer. Russia is facing Croatia in the quarterfinals, and while there are so many cocktails from the country to choose from, we were tempted to just offer you a shot of ice cold vodka and send you on your way. But, it’s summer, so why not a Moscow Mule? Directions: Add ingredients into a copper mug with ice and stir. Garnish with a slice of lime. Croatia traditionally has less of a cocktail culture and more of a “let’s drink brandy straight” culture. Maraska Kruskovac is a pear liqueur made with tree-ripened pears grown in Croatia. It’s a dessert liqueur. Serve it chilled in those long-stemmed tiny glasses. If you don’t dig pears, you can find a Croatia-made liqueur that uses pretty much any fruit imaginable as its base ingredient.